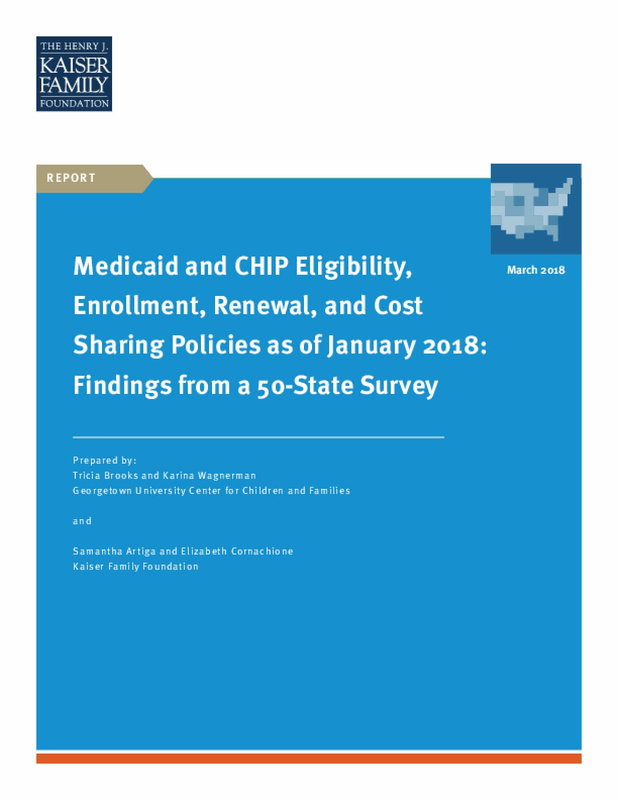 This 16th annual 50-state survey provides data on Medicaid and the Children's Health Insurance Program (CHIP) eligibility, enrollment, renewal and cost sharing policies as of January 2018. It takes stock of how the programs have evolved as the fifth year of implementation of the Affordable Care Act (ACA) begins, discusses policy changes made during 2017, and looks ahead to issues that may affect state policies moving forward. It is based on a survey of state Medicaid and CHIP officials conducted by the Kaiser Family Foundation and the Georgetown University Center for Children and Families. Medicaid and CHIP provide a robust base of coverage for low-income children. All but two states cover children with incomes up to at least 200% of the federal poverty level (FPL, $41,560 per year for a family of three in 2018), including 19 states that cover children with incomes at or above 300% FPL. The ten-year extension of federal funding for CHIP approved by Congress provides states stable funding to maintain children's coverage and continues protections for children's coverage moving forward. There have been major gains in Medicaid eligibility for parents and other adults under the Affordable Care Act (ACA) Medicaid expansion, but eligibility remains limited in the 19 states that have not implemented the expansion. Among non-expansion states, the median eligibility level for parents is 43% FPL ($8,935 for a family of three in 2018) and other adults generally are ineligible. Alabama and Texas have the lowest parent eligibility limits at 18% FPL or $3,740 per year for a family of three. Additional states may expand Medicaid for adults in the coming year, which would reduce the number of poor uninsured adults who fall into the coverage gap. States moving forward with expansion may seek waivers to add requirements or restrictions for adults as a condition of expanding. Through significant investments of time and resources, most states have transformed their Medicaid and CHIP enrollment and renewal processes to provide a modernized, streamlined experience as outlined in the ACA. With these processes, a growing number of states are processing real-time eligibility determinations and automated renewals through electronic data matches with trusted data sources. Looking ahead, waivers and other proposed changes for adults, including premiums and cost sharing, work requirements, and lockout periods, require complex documentation and costly administrative processes that run counter to the simplified enrollment and renewal processes states have implemented under the ACA. Copyright 2018 by Henry J. Kaiser Family Foundation. All rights reserved.